From my inbox, I’ve been a long time student of Bill Gross. He is one of the most influential teachers on the buy-side. He’s a great communicator. He’s somewhat transparent about his positioning. And he’s certainly accountable to his investors’ returns. He’s also got the US Federal Reserve in his back pocket. I’m highlighting the aforementioned quote from Gross’ Investment Outlook missive for October titled “Stan Druckenmiller is Leaving”. It’s one of those macro sentences that you need to read slowly. Then you need to read it again. It’s solid, but it needs a little love. Subtract the qualitative word PROSPERITY and add the words DOLLAR DEVALUATION. Then you’ll see Hedgeye’s New Reality intersect PIMCO’s New Normal. Not that I keep track, but we introduced The New Reality before Gross went with The New Normal. The New Reality abides by the principles of chaos theory. The New Reality is that normal is grounded in uncertainty. The New Storytelling of global markets will be shaped by the math that backs it. The first thing you should say about anything in the area code of a 0.90 correlation is wow. The second thing you should say to the government that perpetuates this debauchery of your currency is shame on you. As for Mr. Gross, I’m not quite sure what to say. After all, he does run the world’s largest bond fund – and that fund proved to not do so well during the DOLLAR DEVALUATION days of 2008. That’s not a shot at Bill Gross. That’s reality. If you debauch the currency of a nation, you will ultimately get inflation. Sequentially rising inflation is bad for bonds. When oil hit $150/barrel and copper was at $4/lbs, neither Greenspan nor Bernanke saw inflation, but PIMCO’s investors did. 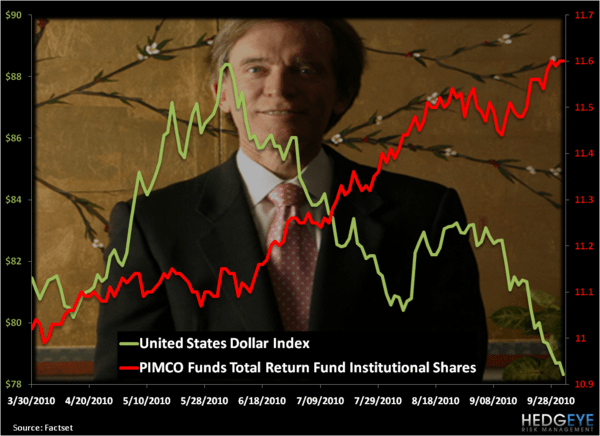 Overlay PIMCO’s Total Return Fund with Treasury Inflation Protected securities (TIPs) for the first 9 months of 2008 and you’ll get the picture. The New Reality is that Bill Gross gets paid to talk about the New Normal, not QE’s impact on the US Dollar. On our immediate term risk management duration, the US Dollar has an inverse correlation versus the PIMCO Total Return Fund of … drum roll for the storytellers in the Haven… -0.91! What we’ve learned in the last few years is that DOLLAR DOWN = REFLATION until these inverse correlations get too high and REFLATION becomes INFLATION. Sure, there’s deflation in US Housing – but there’s been longstanding deflation in the price of tulips and Japanese real estate too. The US Dollar is getting annihilated (down 15 of the last 18 weeks and down -11% since June). Those getting paid by this may not care, but the other 95% of people who live in this country do. How else could the US stock market have its best September since 1939 and US consumer confidence drop? 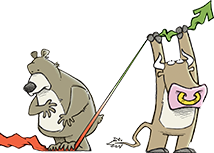 I bought back my inflation protection in both the Hedgeye Portfolio and Hedgeye Asset Allocation Model yesterday (TIP). My immediate term support and resistance levels for the SP500 are now 1140 and 1155, respectively. Correlations in markets are never perpetual, but The New Storytelling of Wall Street is. This note was originally published at 8am this morning, October 01, 2010. INVESTOR and RISK MANAGER SUBSCRIBERS have access to the EARLY LOOK (published by 8am every trading day) and PORTFOLIO IDEAS in real-time.